The global molded fiber clamshell and container market is likely to exhibit rapid growth in the coming years due to steady growth of several key end use industries. Food and beverage packaging is likely to remain a vital end use segment for the molded fiber clamshell and container market over the 2017-2022 forecast period due to the growing demand for packaged food across the world. The consumer electronics and consumer durables industry is also likely to be important for the global molded fiber clamshell and container market over the 2017-2022 forecast period. 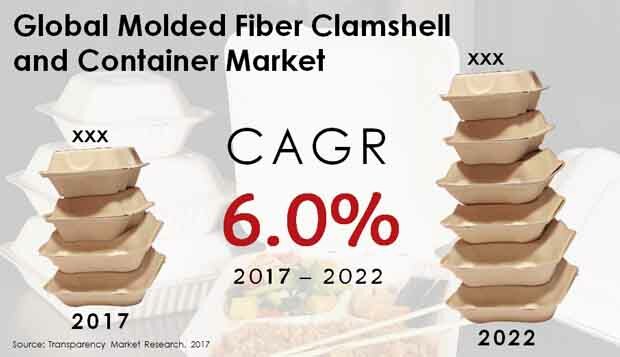 The report provides readers with a comprehensive overview of the global molded fiber clamshell and container market with the help of detailed assessment of the market’s leading segments, key companies, and the market’s competitive dynamics. According to Transparency Market Research, the global molded fiber clamshell and container market is likely to be valued at more than US$2 bn by the end of 2017 and further rise to US$2.7 bn by the end of the 2017-2022 forecast period. The market is projected to exhibit a 6% CAGR between 2017 and 2022. The report segments the global molded fiber clamshell and container market by molded pulp type into thick wall, transfer molded, thermoformed fiber, and processed pulp. Of these, transfer molded pulp is likely to dominate the global molded fiber clamshell and container market over the 2017-2022 forecast period due to their ease of production and low costs. Transfer molded fiber clamshells and containers are thin-walled and made mostly of recycled newspaper, which also makes them environmentally sustainable. The transfer molded pulp segment is likely to account for a majority share of 52.9% in the global molded fiber clamshell and container market by the end of 2017, with a valuation of US$1,069.7 mn. The segment is likely to rise to a valuation of US$1,460.4 mn by the end of 2022 to account for 53.9% of the global molded fiber clamshell and container market, further highlighting its dominance in the global market. For a clear understanding of the geographical distribution of the global molded fiber clamshell and container market, the report studies the performance of the market in North America, Europe, Latin America, Japan, Asia Pacific except Japan, and the Middle East and Africa. Europe is the dominant regional contributor to the global molded fiber clamshell and container market and is likely to reach a valuation of US$923 mn by the end of 2022. The Europe molded fiber clamshell and container market is likely to exhibit a robust 6.2% CAGR over the 2017-2022 forecast period, making it the most attractive regional market for molded fiber clamshells and containers between 2017 and 2022. North America is also likely to remain a key geographical segment for the global molded fiber clamshell and container market over the 2017-2022 forecast period. The North America molded fiber clamshell and container market is likely to be valued at US$485.4 mn by the end of 2017 and further rise to US$642.4 by the end of 2022. The 5.8% CAGR projected for the North America molded fiber clamshell and container market underlines its key role in the global market. Asia Pacific except Japan is also an important regional market for the molded fiber clamshell and container industry, and is expected to generate an absolute opportunity worth US$154.7 mn over the 2017-2022 forecast period. Leading companies in the global molded fiber clamshell and container market include Huhtamaki Oyj, ESCO Technologies Inc., UFP Technologies Inc., Pactiv LLC, Henry Molded Products Inc., OrCon Industries Corporation, KapStone Paper and Packaging, FiberCel Packaging LLC, Biodegradable Packaging for Environment Co. Ltd., Pacific Pulp Molding LLC, Kinyi Technology Limited, Southern Champion Tray, EnviroPAK Corporation, and KEYES Packaging Group. The global molded fiber clamshell and container market report presents readers with comprehensive coverage of the global market on the basis of a solid historical database, which helps demonstrate and analyze the historical growth trajectory exhibited by the global molded fiber clamshell and container market. The latest figures of the global molded fiber clamshell and container packaging market are provided in the report in order to provide readers with an accurate idea of the where the market is at present and which direction it is likely to move in the coming years. Reliable, industry-standard analytical tools are used in the molded fiber clamshell and container market to derive projections for the market’s growth in the 2017-2022 forecast period. The report thus provides readers with a complete view of the global molded fiber clamshell and container market by assessing the granular structure of the market and its competitive dynamics. According to Transparency Market Research, the global molded fiber clamshell and container packaging market is likely to be valued at more than US$2 bn by the end of 2017 and further rise to US$2.7 bn over the 2017-2022 forecast period. The global molded fiber clamshell and container market is likely to exhibit a solid CAGR of 6% over the aforementioned forecast period. The report provides a detailed analysis of the various drivers and restraints affecting the growth of the global molded fiber clamshell and container market. The major drivers aiding growth of the global molded fiber clamshell and container market are assessed in the report to provide readers with a clear idea of which factors are likely to be beneficial for expansion in the molded fiber clamshell and container market in the coming years. The risks and pitfalls in the global molded fiber clamshell and container market are also described in detail in the report to familiarize market players with the factors that could prove to be a thorn in their side in the market. The growth of the consumer durables and food and beverage industries has been the major growth driver for the global molded fiber clamshell and container market and is likely to ensure steady growth of the market in the coming years. The report provides a clear overview of the various components of the global molded fiber clamshell and container market in order to acquaint readers with the granular structure of the market. The top revenue generators in the global molded fiber clamshell and container market are assessed in the report to give readers an idea of which segments represent the best investment opportunities in the molded fiber clamshell and container market in the coming years. The report segments the global molded fiber clamshell and container market by pulp type, distribution channel, and end use. By type of molded pulp, the molded fiber clamshell and container market is segmented into thick wall, transfer molded, thermoformed fiber, and processed pulp. By end use, the global molded fiber clamshell and container market is segmented into consumer durables and electronics, food and beverage packaging, healthcare products, automotive and mechanical parts, transportation and logistics, cosmetics and beauty products, food service disposables, and others. Key distribution channels for the global molded fiber clamshell and container market are institutional and retail sales. The global molded fiber clamshell and container market is dominated by dominant packaging industry players, but significant scope exists for new players looking to establish a strong share in the market. Leading companies in the global molded fiber clamshell and container market include Huhtamaki Oyj, ESCO Technologies Inc., UFP Technologies Inc., Pactiv LLC, Henry Molded Products Inc., OrCon Industries Corporation, KapStone Paper and Packaging, FiberCel Packaging LLC, Biodegradable Packaging for Environment Co. Ltd., Pacific Pulp Molding LLC, Kinyi Technology Limited, Southern Champion Tray, EnviroPAK Corporation, and KEYES Packaging Group.